"Fancy being a benevolent king or a cruel tyrant? Choose an alignment between Good and Evil and form alliances with multiple races such as fairies, elves, angels, goblins, undead and demons in order to improve your coin output. Click to harvest your treasure, build your almighty empire, unleash your magic upon the land and be the richest ruler of the realm!" 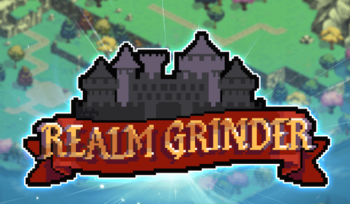 Realm Grinder is an Idle Game created by Kongregate developer DivineGames . The earliest version was released on May. 19, 2015 and has enjoyed a frequent number of updates since, the biggest of which have been refered to as "expansions". In this game, you play as a nameless ruler of a kingdom in an unspecified location with a (not-so) simple goal - become the richest king/queen in the realm.The first person you see in the game is the Advisor. She serves as a tutorial of sorts, explaining various features to the player and offering tips in discovering new things. The primary resource in Realm Grinder is Coins. They are used to buy more buildings and different types of upgrades. You gain more by clicking anywhere in the landscape. Eventually, clicking will become insufficient and your assistants will take care of most of the work for you.Occasionally, an assistant or click will produce a Faction Coin, the secondary resource. These are needed for negotiations with the multitude of races living among the Realm. But you can't form an alliance with any of them wihout choosing an Alignment first. When you start, you can decide whether to be Good or turn Evil in order to attract the presence of the Factions. Each has a different set of playstyle influenced by its upgrades along with a "Faction Spell", a unique spell only that specific faction can cast by spending mana. Every race has its own strengths and weaknesses and it is of most interest to you to take advantage of the various spells to start exploring. As you and your heirs rule through the eras, you will discover ancient civilizations, meet underground dwellers and much more through the eyes of your future selves. A mobile version has been released. You can get it here . Achievement System: Called "trophies", the achievements range from simple tasks such as clicking a bunch of times or having a certain number of buildings. "Secret trophies" on the other hand don't tell you how to get them, but they always reward some sort of upgrade. Adorable Evil Minions: Your assistants, oddly-endearing Lilliputian creatures that help gather more treasure for your kingdom. Naturally depending on your faction they may not be evil nor adorable. The Dragon assistant is a cute little critter that also appears near your advisor's feet on the "Dragon Tamer" upgrade. All Your Colors Combined: The Dragon faction's spell Dragon's Breath. Based on chromatic dragons and designed around the tiered spellcasting mechanic, successfully casting it five times in the same time frame bestows all of its breath effects at once. All Your Powers Combined: Allying with the Mercenary faction grants spells and faction upgrades from all races (including the Neutral Prestige faction, once unlocked) for the player to mix and match, affording carte blanche on playstyle and progression. One achievement takes it further by requiring the player to purchase an upgrade from each and every other faction. Androcles' Lion: How you unlock the Dragons. Taking time to nurture one of the mightiest, most imposing creatures of all the realms has its benefits. Arson, Murder, and Jaywalking: The Demonic racial upgrades all sound as evil as you'd expect, except the last one, which is simply called "Very Bad Guys". Art Evolution: The game began as a simple colored screen with a treasure chest to click on, as well as primitive icons. After the Overhaul patch, you can now see a piece of land containing your buildings built on a path and features pixel style graphics. Ascend to a Higher Plane of Existence: Eventually your treasury will overflow with so much gold that it completely distorts the very fabric of reality. The game's solution to this problem? Essentially make you a god. Gods care not for the trifling gold currency of mortals, anything of interest can simply be taken for free or with fancier, scarcer diamond coins. * Unfortunately your godhood does not matter to other races, you must transact with them normally with their preferred currency. Changing Gameplay Priorities: Because mechanics and perks are unlocked as you progress, the strategies involved may drastically change. Very early game you're likely to use Elves's higher faction coin chance for quicker setup runs, while midgame faction coins aren't as important and therefore choosing other perks is better. The biggest gameplay priority change, however, is after Ascension. Most of the production upgrades you're used to are severely handicapped while more utility ones begin to shine. You are now focused on multicasting your spells and finding ways to either reduce an upgrade's penalty or replace it. Critical Hit: Elves bestow your clicks a chance to earn up to 250,000% more gold than usual. Diminishing Returns for Balance: Par for the course for an incremental game. As such, any upgrade which scales linearly is indispensable. Druid: A Neutral faction, the Druids are a group of Neutral-aligned people who strove to maintain world balance with powerful magic. As such, allying with the Druids will boost your maximum mana, as well as balancing out your weakest buildings by giving them huge boosts. They profit off Stone Pillars, eventually transforming them into Stonehenges. Discard and Draw: What Ascension entails. Most of your production multipliers suffer a Penalty, reducing them to a very small percentage of their previous effectiveness. In exchange, you have the potential to cast any non-Tax Collection spell up to five times, form an alliance with the Dragons (which unlike the other factions do not suffer from penalties of their own) and upgrade your Bloodline to a Lineage. Dummied Out: The upkeep "spell" for the Mercenary faction is a mechanic present in the game's code but never appears in-game. Every hour, you would have to pay a certain amount of coins, which doubled in cost for every time you paid them. Failure to do so and your coins per second and click reward would be reduced to 1 and faction coin chance to 0%. Effortless Achievement: Some of the secret trophies require something as basic as playing the game for 3 hours or staring at the patch notes tab for 3 minutes. Eldritch Abomination: The Faceless are a Neutral Faction of Cthulhu-looking beings whose Hive Mind governs all their choices and behaviors. They have the ability to boost your production based on your past choices while giving progressively better bonuses. They're associated with Labyrinths, which eventually get upgraded into Sunken Cities. Elves vs. Dwarves: Averted. Here, the Elves and Dwarves can ally with each other. Endless Game: The supposed "endgame" doesn't last for long. Late features are periodically implemented to keep playing as long as possible. Evil Counterpart: The evil aligned Drow are this to the good aligned Elves. Faction Calculus: Unique among idle games and probably Realm Grinder's defining feature, the game offers a total of 13 factionsdivided into three alignmentsfor the player to form allegiances with, each promoting a different and distinct approach in amassing unfathomable wealth. Feathered Serpent: The Mercenary faction uses them as their assistants. Five Races: The Good alignment follows this, with dwarves as the 'Stout' hardworking miners and elves as the 'High Men'. Angels are more the 'Fairy' with their focus on magic, and fairies are the 'Cute' as they're of the Peter Pan variety, complete with pixie-dust fertilizer. Despite the common fantasy setting, humans are not a faction in the game, the only evidence that humans exist being your advisor. This presumably makes you the monarch of the 'Mundane' humans. Fantasy Axis of Evil: Should you choose to align with Evil instead. Demons are the 'Savage' with their focus on might, leaving undead as the 'Eldritch'. Drow are still the 'Fallen' pretty-boy backstabbers and the goblins are still the money-grubbing 'Crafty' buggers, again leaving you as the 'Humanoid' of the ensemble. Flavor Text: Present on the Artifacts and Challenges. Gotta Catch 'Em All: Aside from the standard trophies, Realm Grinder introduces collectibles such as artifacts, heritages, and bloodlines. All of which boost production in some way. Guide Dang It! : For starters, only the names of most of the Secret Trophies are visible. There is only one in-game hint for one of them, the rest are found either by accident or by looking them up. Some later features come with their own requirements and are likewise hidden. HeelFace Revolving Door: Good, Evil, Neutral? It doesn't matter what side you choosethis life or the nextas long as it means more treasure. No one seems to mind you sided with their mortal enemy during your previous sovereignty anyway. Hellfire: The Demonic Hellfire Blast increases your coin output the more trophies you managed to unlock. Holiday Mode: 8 different Events have been held so far. Most of them come with a Quest series who give a permanent bonus even after the Event ends. When a previously held Event starts again, the Quest series for it resets, but its previous bonus remains. Completing quests and sometimes other tasks will also award Feats, a special kind of Trophies. Some Events allows you to get more Rubies. Valentine's Day: The Mana Meter turns red and Call to Arms becomes Call to Love, earning more Hearts per second depending on how long you kept the spell active. The Hearts can then be spent on upgrades in a manner similar to Rubies. Easter: You can collect Common Eggs which are then exchanged for Rare ones. The rare ones can then be used to buy specific upgrades or 8 Unique eggs. The Unique eggs grant you a very useful upgrade as well as a free Ruby. April Fools' Day: A rather powerful looking upgrade appears, but buying it doesn't do anything. Then another one that claims to fix it shows up and so forth. Buying them quickly actually reduces your production for nearly an hour. These upgrades poke fun at some of the playerbase's complaints towards the game. Anniversary: Gives an upgrade for a short time that boosts production depending on how long you've played. Summer Festival: Brings two temporary "mini" factions: The Summeraans and the Winterly. To befriend them, you have to spend Flame Orbs for the Summeraans and Frost Orbs for the Winterly while allied with another faction. Allying with one of them grants 3 of their respective racial upgrades as well as their unique spell: Heatwave or Hailstorm. Halloween: This Event give daily presents in the form of Pumpkins. Smashing a Pumpkin reveals a Ruby, event resources and a random monster of three: Vampire, Ghost or Skeleton. You feed the monster with Blood, Ectoplasm or Bones, respectively. A monster fed enough times will level up, giving more perks as well as one spell for each monster. Thanksgiving & Black Friday Sale Event: Thanksgiving gives a temporary 25% to production upgrade, while Black Friday gives a 50% discount to Gift of the Heroes during the event. Christmas: You collect Snowballs that powers up the event only Avalanche upgrade. You also get a daily Christmas present, containing either Snowballs or Rubies. Jack-of-All-Stats: The Neutral alignment is eclectic and versatile, not focusing on a single aspect of the game but picking something from all of them. Kill Screen: Being made in Flash, the cap to any value in game is e308. The Ascension reset mechanic was implemented to prevent this, as well as impose a very harsh penalty to most upgrades unlocked up to that point. Lunacy: The Elven Moon Blessing spell grows stronger as you accumulate more clicks. Last Lousy Point: Unless you're willing to spend your Rubies on Time Skips,* arguably the best option to spend Rubies on anyway, as the game tracks time spent for many upgrades, every unlockable with a time requirementranging from eight hours to ten daysbecomes this. Lightning Can Do Anything: It gives you faction coins every time it strikes, as well as boosting the power of a building stack. The Titan Lightning Strike spell boosts a building by 4x (or 5x if upgraded) the number of Iron Strongholds you have, which is a massive amount. The catch is that the building is targeted at random. Taken Up to Eleven for their Tier 4 Challenge. You need Lightning Strike to hit the Hall of Legends twice in a row (where there are 11 buildings total) and you're not allowed to "cheat" here (either by skipping buildings, as you need at least one of each building; or by Lightning Rod / Craftsmanship 375 (a Research upgrade exclusive to Titans that makes Lightning Strike hit Halls of Legends and one other target at random), since you're not allowed to buy Researches), so that's a 0.83% chance of it happening. Goblin's first challenge asks of you to get 1000 times your coin production from Green Fingers Discount. This upgrade gives a random amount of coins (1 to 1200 seconds of production) every 10 minutes, meaning you can get it very soon or very late. Mana: You get more in the form of Mana Points per second. It pays to get as much mana as possible in order to make spells cast by themselves. Gem Duster (Craftsmanship 340): multiplicatively boosts gem production from Rubies found. Even Rubies found without purchasing them are just enough to make this a must-have. Vivication (Alchemy 120): adds assistants according to your mana pool, which keeps increasing the more you reincarnate, thus always providing a hefty amount. Formation (Warfare 180): The Call to Arms spell increases production from the amount of buildings you own. This upgrade makes each building count as 15 buildings instead. Even after an Ascension Penalty, a Call To Arms 5 with Formation is more powerful than most Faction Spells in that stage. Scavenging (Warfare 1375): Boosts your faction coin chance according to your assistant amount, in addition to a multiplicative 275% boost. Goes hand in hand with Vivication mentioned above, this upgrade is essential for every build to set up a run quickly. The first Undead Lineage perk: It changes its bonus from a fixed number of additional assistants into a multiplier, resulting in an absurdly high count of assistants reaching hundreds of thousands. Moreover, it fuels key upgrades that use assistants as their basissuch as Magical Treasure, which adds a fixed* i.e. linearly scaling amount of mana regeneration per assistant. Min-Maxing: Of course. Inefficiency has no place in your realm when your objective is to be the wealthiest monarch to ever exist, especially with numerous tools at your disposal! New Game+: Gem Power is the main source of coin production, growing more powerful the more Gems your kingdom has found. To get them, you must Abdicate from your rule, breaking off any alliance with the faction you had in that session as well as forfeiting all (faction) coins and buildings built, but allows you to ally with another faction, even the same one or in a different Alignment. But this won't be enough as any kingdom you develop will begin to stagnate until you Reincarnate. No Points for Neutrality: Inverted. The Neutral Alignment's options are vastly superior than both Good or Evil's. There's a trophy for having a total playtime for Evil above 6 days, 66 hours, 666 minutes and 666666 seconds. Demons Challenge 2 requires you to have exactly 666 non-Demon Royal Exchanges purchased within 666 seconds of starting a new game. The reward is an increase of maximum mana when playing Fairy, based on 6.66% of the number of Hall of Legends you've built. One of the relics you can excavate requires playing as the Demons while having 666 or more trophies. The Paladin: A Dwarven Challenge reward. The spell Holy Light becomes more powerful depending on the number of Knights Jousts and Wizard Towers you have built. Obvious Rule Patch: The Grand Balance spell used to target the weakest bought building for a huge boost, thus it was possible to skip buying Deep Mines and make the spell target the next building tier, resulting in higher production than usual. This has been changed so that Grand Balance will always target any unbought building. Our Angels Are Different: The Angels are good aligned, winged and hooded creatures who help you get rich from the gates of Heaven, which eventually open, becoming stronger as you use magic more often. Mana is everything to them, thus they are faster to afford to cast spells than most factions early on. Our Demons Are Different: The Demons are a race of evil, power hungry horned humanoids with a face resembling that of a skull. They prefer to profit off their Evil Fortresses and Hell Portals, and eventually the Hall of Legends. They are strengthened by trophies, alluding to their quest to power. Later they succeed in transforming their portals to Hell itself. Our Dragons Are Different: Dragons are grand and mighty, refusing to ally with non-Neutral factions, and as such are a Prestige Neutral faction. All their abilities are very powerful and even have a heritage that persists through reincarnations. Iron Strongholds are their favoured building, which are eventually transformed into Wyrm's Dens, a more fitting accommodation for them. Our Dwarves Are All the Same: The Dwarves are a Prestige Good Faction, and like most standard depictions are sturdy bearded, stout, cheery, ale-loving miners and blacksmiths who live underground. They primarily focus on Excavations, having multiple abilities that grow in power the more excavations the player has performed. They eventually upgrade their Blacksmiths into Dwarven Forges. Our Fairies Are Different: The Fairies are represented as small, pink, singing figures from the Good Alignment. They focus on making their cheapest buildings even cheaper, but also stronger. They also like to gather as many assistants as possible, whose number is then amplified to quickly earn Gems. Our Goblins Are Different: The Goblins look like the common depiction - small, pointy eared and greedy, residing in the Evil Alignment. Their plan is to have as many buildings as possible to earn Gems, which are twice as powerful and grant more Faction Coins the more in number. Goblins suffer from no extra mana generation whatsoever at the start, but later they become one of the most useful races in the game. The Elven are from the good Alignment, have pointy ears and are one of the most active races in the game. Their clicks are much stronger than everyone else's and acquire Faction Coins very easily. The downside is, don't expect much profit from them if you feel like idling more. At least, not until they recieve aid from the Sun itself. They'll decide to start training more troops to help with the coins. The Drow are a Prestige faction of the Evil Alignment, and like most depictions, are deceptive, shadowy, dark-skinned elves that live underground who worship an evil religion. Being manipulative, a good number of their abilities revolve around Royal Exchanges, and they are a great at complementing the Evil factions thanks to increasing mana regeneration as time passes. They eventually upgrade their Dark Temples into Spider Sanctuaries. Our Titans Are Different: The Titans are an ancient race of godlike beings and millenia of knowledge, and are of the Neutral Alignment. Just like how big and powerful they are, their abilities boost your economy to massive numbers. They profit off several buildings such as Deep Mines and Monasteries, but it is the Hall of Legends which are eventually upgraded to Olympian Halls themselves. Point Build System: The Research mechanic, first introduced in the "Secrets of the Realms" patch, allows you to choose a limited amount of upgrades from 6 different Research Facilities. You can only pick 4 from each Facility, but as you progress through the game and depending on the faction chosen, you can increase this limit as well as choose from unique upgrades, allowing the possibility of more diverse builds. Power of the Sun: It clicks for you! Prestige Class: There are three factions which you cannot ally alone with and must first establish relations with races from their respective Alignment. The Dwarves for Good, Drow for Evil, and the Dragons for Neutral. Red increases the production of Unique Buildings based on the amount of Faction Coins found. Green increases the production of all buildings based on the amount of spells cast. Higher bonuses are provided to lower building tiers. Blue increases mana regeneration by 200%. White temporarily increase the amount of assistants based on total time spent being neutral. Black increases the production all buildings based on Dragon's Breath spell activity time. Satan: A good aligned Mercenary using only evil upgrades or vice versa awards the "Lucifer" trophy. Save Scumming: A save can be exported and imported at will, so you can do just that when trying to excavate for any missing artifacts. Secret Art: After completing a quest to unlock a faction's unique building, the Research Facilities open, where you can unlock special upgrades that only specific factions can use. Prestige factions gain an additional 3 along with the standard 6 for every race, one for each combination. Only an Elven/Dwarven alliance for example can use the "Alloys" upgrade. Skill Scores and Perks: Many of the generically-termed "Upgrades" function like perks; the Mercenary and the Research systems in particular bring the inner minmaxer out of most players with their abundance of options. Skill Point Reset: You must purchase upgrades again every time you abdicate or reincarnate. Fortunately the game lets you do so with a single button and can let you save Mercenary and Research configurations. Soul Power: Reincarnation Power, a free upgrade that bestows increasingly growing perks and features in length and strength the more times you reincarnated. Spiritual Surge is a rather expensive spell available to cast after your soul has become powerful enough. Spell Levels: Every spell except Tax Collection can be upgraded to the sixth tier, allowing you to simultaneously cast it up to the number of tiers you've unlocked. Stop Poking Me! : Clicking a hundred times on your assistant or advisor awards a trophy for it. The former appears to receive a black eye. Tech Tree: The Research progress system. See Point Build System above. Spellcraft's upgrades are related to mystical effects. Craftsmanhip's upgrades are related to invention and mining. Divine's upgrades are related to light and biblical terms. Economics's upgrades are related to business and trading. Alchemy's upgrades are related to chemical effects and poison. Warfare's upgrades are related to war and battle tactics. The Undead: An Evil Faction, the Undead appear to be some sort of skeleton/zombie hybrid. Patience is required to play as them, as they only get stronger as time passes, accumulating more assistants along the way. It is possible to make progress with them without even being online. The source of most of their strength is the Necropolis building. Villains Act, Heroes React: Inverted here. The Evil factions are focused on being less proactive and more idle-based compared to the more active Good factions.